At the April 22, 2010 briefing, Foreign Ministry spokesman Andrey Nesterenko spoke about the BRIC summit, the signing of a new Russia-Ukraine deal on the Black Sea Fleet and other current international issues. 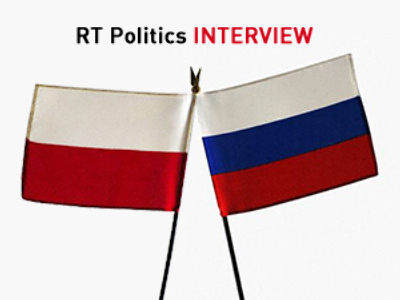 RT presents the full transcript of Andrey Nesterenko’s briefing from April 22, 2010. The second full-blown BRIC summit involving Russian President Dmitry Medvedev, Brazilian President Luiz Inacio Lula da Silva, Indian Prime Minister Manmohan Singh and Chinese President Hu Jintao took place in Brasilia on April 15, constituting a sequel to the dialogue at the highest level which had begun last year in Yekaterinburg. The talks in Brazil’s capital showed that relations among the four nations are on the rise, embracing new directions in politics, economics, and finance. The main topics of discussion were the co-operation of the BRIC countries in overcoming the global financial and economic crisis and the problems of post-crisis development, including in the context of the preparation of upcoming G20 summits in Toronto and Seoul; the advancement of the reform of international financial institutions; and joint counteraction to new challenges and threats, including international terrorism. Also considered were the possibilities of co-operation in preparation for the 16th Conference of the Parties to the UN Framework Convention on Climate Change. The leaders of the BRIC countries exchanged views on directions and forms of further co-operation in the four-nation format. The discussion resulted in agreement to deepen BRIC interaction on the international stage, aimed at bolstering collective and legal principles in world politics, and advancing the common position of Russia, Brazil, India and China regarding the reform of global governance institutions coupled with a polycentric, more equitable and democratic international system in the making – including maintaining regular contact on G20 issues and on enhancing the four states’ role in the articulation of clear “rules of the game” within it. The meeting ended with the adoption of a Joint Statement of the BRIC Countries’ Leaders, which has been published – and posted, in particular, on the Russian Foreign Ministry website – and which reflects their common vision of the current stage of world development. It stressed the importance of concerted efforts to overcome the effects of the global financial crisis and the greater need for a more stable, predictable and diversified international monetary system, and highlighted the priorities for multilateral co-operation on several key issues on the international agenda. The leaders’ decisions aim at deepening co-operation among the four nations based on shared interests, and the desire of the BRIC countries to make a joint contribution to accelerating the recovery of the world economy, to promoting international stability and security and to addressing global and regional problems. The summit announced the release by the BRIC countries of a join statistical publication with data on each of the four nations, which will be reissued annually. In the presence of the leaders, a Memorandum of Co-operation among the state financial development and exports support institutions of the BRIC countries was signed (the Memorandum participants are Vnesheconombank, China Development Bank, the National Bank for Social and Economic Development of Brazil and the Export-Import Bank of India). In conjunction with the summit, a number of other events took place such as: the second meeting of high representatives on security; a meeting of development banks; a co-operatives forum, a think-tank seminar, and an entrepreneurs’ forum with the participation of representatives of business circles of the BRIC countries. Overall, the summit demonstrated the growing awareness of the commonality of fundamental interests of the BRIC countries, which in present-day conditions are directly related to development – the chief means of ensuring national security. The summit has revealed the vast potential of the four-sided dialogue and co-operation in key areas of international life, bearing in mind that globalization is breaking down the distinction between external and internal means of ensuring the security of states. The summit bore visible testimony to the growth in demand for such co-operation through a multipolar network diplomacy which is not directed against anyone else, as was the case in the past, but aims to secure the vital coinciding interests of partner countries. The next BRIC summit will be held in China in 2011. Islam Karimov, the President of Uzbekistan, paid an official visit to the Russian Federation from April 19-20, 2010. He met with President Dmitry Medvedev and Prime Minister Vladimir Putin. The agenda of the Russian-Uzbek summit included topical issues in bilateral co-operation. The presidents noted the positive dynamics in our economic and trade ties and called for further diversification and saturation of the co-operation with new projects, primarily in energy, aircraft construction, mechanical engineering, transport and telecommunications. They pointed out the importance of bilateral co-operation in combating illegal migration, money laundering and terrorist financing, as well as of strengthening our cultural links. They focused separately on the situation in Central Asia in the context of recent events in Kyrgyzstan and on preparations for an SCO June summit in Tashkent. The talks at the highest level ended with the signing of a Joint Statement of the Presidents of Russia and Uzbekistan, along with a Program of Co-operation between the Government of the Republic of Uzbekistan and the Government of the Russian Federation in the Cultural and Humanitarian Sphere for 2010-2012; a Memorandum of Understanding between the Government of the Russian Federation and the Government of the Republic of Uzbekistan on the Facilitation of Implementation of the List of Military-Technical Co-operation Activities between the Russian Federation and the Republic of Uzbekistan for 2010-2012, and a Protocol between the Federal Customs Service (Russian Federation) and the State Customs Committee of the Republic of Uzbekistan on the Arrangement of an Experiment on Advance Information Sharing. The visit of Uzbek President Islam Karimov to Russia constituted a logical sequel to the trustful contacts between the leaders of the two countries, and confirmed the mutual disposition towards the practical development of Russian-Uzbek strategic partnership. Karimov invited the Head of the Russian State to visit Uzbekistan at a time convenient to him. A meeting took place on April 20 between Russian President Dmitry Medvedev and Armenian President Serzh Sargsyan. The Heads of State discussed, in particular, topical issues of the international and regional agenda. More detailed information about the meeting is posted on the Russian President’s website. Russian President Dmitry Medvedev paid a one-day visit to Ukraine yesterday. As part of his visit to Kharkov, an Agreement on the Presence of the Russian Black Sea Fleet on the Territory of Ukraine was signed at the end of the meeting of the Russian Head of State with President of Ukraine Viktor Yanukovich. In accordance with the document, the period for stationing the Russian base on the Black Sea has been extended for 25 years. The parties have also agreed on a possible further 5-year extension. Ratification of the Agreement will be considered by the Russian State Duma and the Ukrainian Verkhovna Rada simultaneously. This arrangement was also reached in the course of the talks between Medvedev and Yanukovich. Supplements to the contracts on the conditions of sale and transit of Russian gas in the years 2009-2019 between Gazprom and Naftogaz Ukrainy were signed in the presence of the two presidents. At the final press conference, Medvedev said that the signed documents are a real collaborative step of the two countries towards each other. Also, the Russian Head of State said that as a result of the signing of the fleet presence agreement, instructions will be given to Defense Minister Anatoly Serdyukov and Navy Commander Vladimir Vysotsky to make arrangements to have the Black Sea Fleet base participate in the socio-economic development of Sevastopol. 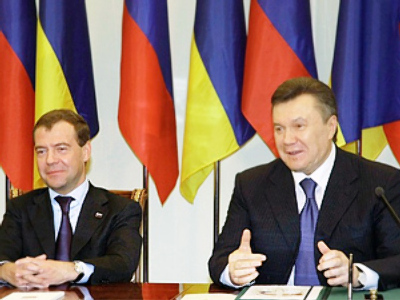 Earlier that same day, Medvedev and Yanukovich held a meeting with the heads of the border regions of Russia and Ukraine in which, inter alia, questions such as bolstering economic ties and co-operation in production, developing small and medium businesses and simplifying the customs and migration regimes were discussed. Russian Prime Minister Vladimir Putin will be in the Republic of Austria on a working visit from April 24-25. In his talks with Federal Chancellor of Austria Werner Faymann, it is proposed the prospects for bilateral co-operation, including in the energy, transportation, cultural and humanitarian fields be discussed, as well as questions of regional co-operation and a number of topical international problems. The program of the visit includes Putin’s meeting with the Federal President of the Republic of Austria, Heinz Fischer. The Russian Prime Minister will also lay a wreath at the monument to Soviet soldiers who died during the liberation of Austria in the spring of 1945. Prime Minister Vladimir Putin will pay a working visit to the Italian Republic from April 25-26. Putin and Italian Prime Minister Silvio Berlusconi in their talks will discuss issues relating to Russian-Italian co-operation in the trade, economic, cultural and other fields, as well as questions of the interaction between the two countries in the international arena. Minister of Foreign Affairs Sergey Lavrov has just concluded talks with his Australian counterpart, Stephen Smith, who is on a two-day working visit to Russia. The Ministers conducted talks in a constructive and friendly atmosphere and discussed a wide range of bilateral and international issues. The heads of the foreign affairs agencies expressed satisfaction with the intensification of political dialogue and the positive nature of bilateral co-operation in different areas. In this regard, they noted the recently-gained additional dynamics of highest-level and high-level meetings, including on the sidelines of multilateral fora, which make it possible to compare notes on a wide range of topical issues on the bilateral and global agenda. A more detailed assessment of the talks was given by the Ministers during their final press conference, the text of which is posted on the Russian MFA website. Also today, Minister of Foreign Affairs Sergey Lavrov met with the Secretary General of the Co-operation Council for the Arab States of the Gulf (GCC), Abdurrahman Bin Hamad Al-Attiyah. More detailed information about Al-Attiyah’s visit to Moscow can be found on the Russian MFA website. The second part of the 61st session of the Parliamentary Assembly of the Council of Europe will be held in Strasbourg from April 26 to 30, 2010. At Assembly President Mevlut Cavusoglu’s invitation, Minister of Foreign Affairs Sergey Lavrov will take part in it on April 29 as a special guest. On that day, he will address the plenary meeting of the Assembly and meet PACE President Cavusoglu and Secretary General of the Council of Europe Thorbjorn Jagland. The session’s agenda is extremely intense: more than 20 major issues in global and European politics are to be considered over the course of five days of work. More specifically, it includes discussing reports on the effects of the global economic crisis and its impact on migration flows in Europe; on lobbying in a democratic society; on countering extremism and fighting sea piracy, on the migrant problems in Europe; on the protection of sexual minority rights and on the effective implementation of the European Convention for the Protection of Human Rights and Fundamental Freedoms: the Interlaken Process. Council of Europe Commissioner for Human Rights Thomas Hammarberg will present his annual report on the human rights situation in the Council of Europe member states for the year 2009. Lavrov's visit to Strasbourg for the PACE session is taking place in the run-up to the 65th anniversary of the Victory in the Great Patriotic War of 1941-1945. The speech by the Minister to the PACE deputies, representing 47 European nations, is a good opportunity to attract the attention of a wide European audience to the forthcoming anniversary, underscore the decisive contribution of the Soviet Union to the defeat of fascism and set out Russia’s approaches to the most burning issues for international politics and, first and foremost, to the creation of a new security architecture, including the perspectives of a European Security Treaty. In his speech, Sergey Lavrov is going to raise the inadmissibility of the falsification of history and to touch upon the role of the Council of Europe in overcoming the consequences of the Cold War and its consequent dividing lines. In Russia’s perception, the Council of Europe is one of the key bodies in the Euro-Atlantic space and an essential tool for building a common legal space of the Wider Europe. The Russian side has since the days of its chairmanship of the Committee of Ministers in May-November 2006, guided by the agreements and documents of the Council of Europe’s Third Summit in 2005, persistently raised the question of adaptation of the Council of Europe to the new realities of the modern world through the full implementation of the provisions of Article 1 of the Council of Europe: “The aim of the Council of Europe is to achieve a greater unity between its members for the purpose of safeguarding and realizing the ideals and principles which are their common heritage and facilitating their economic and social progress.” The Russian Federation upholds the policy of maintaining diversity in the work of the Organization. Rather than narrowing the mandate of the Council of Europe, increasing its effectiveness and promoting the co-operation of states under the auspices of the Council in all its areas of competence is the key to the future for the Organization. Structural reforms should not harm the ongoing work on a broad list of topics, among them social issues, including protection of the disabled and children; the fight against new challenges and threats, particularly terrorism and money laundering; protection of individual rights in cyberspace and the development of information technology; culture and heritage; education, youth and sports. The agenda of the session includes discussing the issue of overcoming the consequences of the events of August 2008. A report on this theme will be presented by the co-rapporteurs of the PACE Committee on the Honoring of Obligations and Commitments by Member States of the Council of Europe (Monitoring Committee), the Hungarian Matyas Eorsi and Englishman David Wilshire. It will be based on the results of their visit to Georgia and Abkhazia on April 13-16 and to Russia on April 19-20, 2010. Also scheduled at the session is the speech of the head of the International Fact-Finding Mission on the Conflict in Georgia, Ms. Heidi Tagliavini (Switzerland). In accordance with the instructions of the Minister of Foreign Affairs of the Russian Federation, Sergey Lavrov, the Ministry set up an emergency response headquarters, headed by First Deputy Minister Andrey Denisov. The headquarters is made up of the heads of the Consular Department, the Press and Information Department, the Department of Security and the territorial departments in charge of the European sector, constantly liaises with diplomatic and consular agencies and co-ordinates their activities to assist Russian citizens who cannot return home or continue their journey to their destination due to the volcano eruption in Iceland. The headquarters is simultaneously dealing with matters relating to the sojourn of foreign nationals. Russian consular agencies overseas have been instructed to assist compatriots stranded abroad, especially in European airports. Emergency response headquarters have been set up in the embassies and are in touch with air carriers and travel companies. Conversations have been held with Jean-Louis De Brouwer, Acting European Commission Director General for Justice, Freedom and Security, in the foreign affairs agencies and with the immigration authorities, resulting in an agreement that the Russian citizens caught up in the force majeure will be free to leave their host countries, will not be penalized and will have no problems in obtaining visas to those countries in the future. Our consular agencies in several countries, primarily Germany, have helped a part of the Russian citizens be sent home by road. Given the complicated situation in the UK, where embassies of EU member countries were refusing to issue visas to Russians who had decided to use alternative routes to return to Russia through continental Europe, we sent a relevant message to the European Commission. On April 19, the European Commission adopted visa recommendations for member countries that have practically completely alleviated the visa problems for Russian citizens. To solve the problem with foreign nationals delayed in Russia due to the shutdown of European airspace, an intense work regime for the Ministry’s consular posts in Vnukovo, Sheremetyevo, Domodedovo (staff doubled) and Pulkovo-2 (put on 24-hour watch) Airports was introduced from April 16. For EU nationals holding Russian visas that have expired due to the force majeure, visas are issued free of charge for 72 hours. Consent has been obtained from the Russian FSB border guard service to allow aliens with expired visas to pass, if it is no more than three days from the expiry date. Our consular agencies in many European countries have made arrangements for informing Russian citizens on force majeure related questions of concern to them. A US Boeing 767 made an emergency landing at the Lajes Airport (Portuguese island of Terceira) on April 21 at 7.40 am local time. The plane, belonging to United Airlines, was en route from Washington to Moscow. The crew took the decision to land after the appearance of a sharp smell of smoke in the cabin. There were 188 passengers on board, 129 of them Russians. All passengers were accommodated in three hotels and provided with food, an official from Portugal’s SATA airline said. According to information we have, the passengers’ departure to Moscow is scheduled for the middle of the day. In accordance with the agreement reached, a US interagency delegation led by Ambassador Michael Kirby, Principal Deputy Assistant Secretary of State, will be in Moscow on April 29-30 for consultation at the Russian Foreign Ministry on the whole range of adoption issues. As part of these negotiations, we are planning to discuss the prospects of concluding a bilateral, legally-binding agreement that would guarantee the reliable legal protection of adopted Russian children and provide effective mechanisms for screening potential adopters and monitoring by the relevant bodies of Russia and the United States over the conditions of life in American families, including access to them by staff of our consular agencies. We are looking forward to a useful and constructive dialogue. We believe that solving the problem on a legal plane, given its sensitivity and visibility, would fully serve the interests of both adopted children and adoptive parents. In this connection I would like to draw your attention to the press conference of the Russian Presidential Commissioner for the Rights of the Child Pavel Astakhov, held on April 19. We continue to closely monitor the situation of Dennis Khokhryakov (Diego Sologub), born in 1998, who was taken by his adoptive parents, also Russian citizens, to the Dominican Republic in 2004 (the adoption decision was canceled in 2009). As you know, after a while the boy's foster parents left for Russia, leaving him with their Dominican acquaintances who, as the adopters did not intend to return, passed Dennis into local custody. In addition to the MFA information published on this issue, I can report that our Ministry, together with the Russian Federal Drug Control Service (probing a drug smuggling charge against the adopters of Denis Khokhryakov), is taking all necessary steps to return the child to Russia. Russia's ambassador to Venezuela, V. F. Zaemsky, who is concurrently accredited to Santo Domingo, during a meeting with the Attorney General of the Dominican Republic, Radhames Pena, requested information about the local formalities that must be fulfilled for the return of the boy home. Virginia Velasquez de Simo, Russia’s honorary consul in the Dominican Republic, is in direct contact with the Dominican authorities and communicates regularly with Denis. She said, and orphanage director J. R. Sanchez confirmed this in a telephone conversation with embassy officials, that the boy’s condition is excellent. On April 20, 2010, the head of the consular department of the Russian Embassy in Venezuela flew to the Dominican Republic’s capital, Santo Domingo, to meet with Denis Sologub and the Dominican authorities. Information on the outcome of the visit will be posted on the MFA website. We continue to closely monitor the still-volatile situation in Kyrgyzstan. We presume that the chief thing for Kyrgyzstan today is to prevent the emergence of new, and even more so the escalation of recent, manifestations of anarchy and violence and to legitimize the institutions of power. We believe that the resignation tendered by Kurmanbek Bakiyev on April 16 and his departure from the country are a factor contributing to the efforts of the Interim Government to return the country to normalcy. As reported earlier, President Dmitry Medvedev instructed Defense Minister Anatoly Serdyukov to take measures to ensure the safety of Russian citizens in the Kyrgyz Republic and to beef up the protection of Russian facilities in connection with the increasing incidence of seizure and raids in that country. Detailed assessments of the current situation in Kyrgyzstan have been given by the leadership of our country. And on one more story concerning the Kyrgyz topic. In some media there have appeared different interpretations of the CSTO’s position with regard to the situation in Kyrgyzstan. In this connection, I report that Valery Semerikov, CSTO Deputy Secretary General, was in Bishkek from April 8 to 12, where he, in co-ordination with OSCE, EU and UN representatives, explored the possibility of rendering humanitarian assistance and resolving the domestic political crisis and held an exchange of views and assessments of the reports of the developments in the situation. Thus, the CSTO has from the outset joined the efforts by international organizations to normalize the situation in Kyrgyzstan. President Dmitry Medvedev, who is currently the chairman of the Collective Security Council of the Collective Security Treaty Organization, has said that Russia is interested in the early stabilization of the socio-economic situation in Kyrgyzstan. Moscow has noted a statement from Bishkek that the new Kyrgyz government is willing to continue close co-operation within the CSTO framework in all activities of the Organization. As for the representatives of Kyrgyzstan in the standing bodies of the CSTO, they continue to perform their functions as before. Developments in Kyrgyzstan are under the scrutiny of the Collective Security Treaty Organization and the Russian chairmanship. The CSTO will continue its efforts to promote normalization of the situation in the country. The 10th ministerial meeting of the Gas Exporting Countries Forum (GECF) took place on April 19 in Oran, Algeria. It was attended by delegations of the GECF member countries (Algeria, Bolivia, Equatorial Guinea, Egypt, Iran, Libya, Nigeria, Qatar, Russia, Trinidad and Tobago, and Venezuela) and by observers from the Netherlands and Norway. The representatives of Angola and Yemen participated as guests of the ministerial meeting. Energy Minister Sergey Shmatko headed the Russian delegation. It was the first GECF ministerial meeting since the election of the General Secretary of the organization. A Russian representative, Leonid Bokhanovsky, became the one. The heads of the GECF energy agencies discussed the state of international gas markets, the questions of co-operation among the members of the organization by exchange of assets and technology, and the prospects for deepening co-operation between natural gas producing and consuming countries. The ministers endorsed the Secretary General’s GECF Secretariat Activity Report, and approved a set of regulations governing its functioning. Following the meeting the ministers agreed to explore the possibility of holding the 1st Gas Summit in 2011, and took decision to establish a working group which is to develop conjointly with the Secretariat a long-term (five years) strategy for the activities of the organization. The next ministerial meeting of the GECF is scheduled for December 2, 2010 in Doha (Qatar). Rapporteurs of the PACE Monitoring Committee Matyas Eorsi (Hungary) and David Wilshire (United Kingdom) made a trip to the South Caucasus from April 11 to 15, and David Wilshire also to Moscow on April 19-20 on the theme of the conflict between Georgia and South Ossetia in August 2008. According to available information, they were received in Georgia by the Speaker of Parliament, Deputy Minister for Reintegration and Foreign Affairs, and the Minister of Refugees and Resettlement. In Abkhazia, they met with the President of the Republic, Minister of Foreign Affairs, and the Speaker of Parliament, and had the opportunity to visit the Gali district. On April 19, David Wilshire met in Moscow with First Deputy Chairman of the Federation Council Alexander Torshin and members of the international affairs committees of the Federation Council and State Duma, with Deputy Secretary of the Russian Security Council Yuri Zubakov, with Deputy Chairman of the Investigative Committee of the Prosecutor General’s Office Vasily Piskarev, with Deputy Minister of Regional Development Poman Panov and Human Rights Commissioner Vladimir Lukin. On April 20, Wilshire was received by Sergey Lavrov, Minister of Foreign Affairs of the Russian Federation. They discussed possible forms of co-operation between Russia and PACE in Transcaucasia. The Russian side urged the representatives of the Assembly to exercise the utmost responsibility in forming their stand on questions associated with the consequences of the Georgia-South Ossetia conflict, with due consideration for the new political and legal realities in the region, in order to normalize the humanitarian situation there and implement post-conflict settlement measures. A conference entitled “International Disarmament and Non-Proliferation: World Security without Weapons of Mass Destruction” was held in Tehran on April 17-18. The event was attended by senior leaders of the IRI and by officials at the level of ministers and deputy ministers and other representatives from more than 50 countries who presented their national approaches and priorities in the field of non-proliferation of weapons of mass destruction and nuclear disarmament, including in light of the upcoming Review Conference of the Nuclear Non-Proliferation Treaty (NPT) in New York in May. In addition, representatives of the expert community and specialized non-governmental organizations delivered reports. The Russian side at the forum was represented by Deputy Foreign Minister Sergey Ryabkov, whose statement described in detail the work done in Russia in preparation for the NPT Review Conference. It was particularly emphasized that the success of the Conference would largely depend upon its success in providing a balanced approach to the three pillars of the Treaty: non-proliferation, disarmament and peaceful uses of atomic energy. A separate section was devoted to Russia's nuclear disarmament efforts, above all – to the content of the Treaty on Measures to Further Reduction and Limitation of Strategic Offensive Arms, signed by the Presidents of Russia and the United States in Prague on April 8. The statement underlined the importance of further strengthening the IAEA safeguards system, and the need for a new proliferation-resistant architecture of international co-operation in peaceful uses of atomic energy on the basis of multilateral approaches to the nuclear fuel cycle. The Russian representative held conversations with Deputy Secretary of Iran’s Supreme National Security Council Ali Bagheri and Deputy Foreign Minister Mohammad Akhundzadeh, focusing mainly on the problems with Iran's nuclear program and on preparations for the NPT Review Conference. On the forum’s sidelines Sergey Ryabkov also met with the head of the Chinese delegation, Assistant Foreign Minister Cheng Guoping. They exchanged views on topical issues of the regional and international agenda. Before the briefing in this connection, I was asked about how the Russian Foreign Ministry could comment on the proposal of Mahmoud Ahmadinejad for an independent global body to oversee nuclear disarmament and prevent non-proliferation. At the international conference on disarmament and non-proliferation that was held in Tehran on April 17-18, many different ideas were expressed by official representatives of both Iran and other participating countries. We think that these proposals should be carefully examined during the NPT Review Conference opening on May 3, in order to work out a consensus “package” of effective and practicable measures to further strengthen the Treaty on the basis of a well-aligned balance of its three major pillars: non-proliferation, disarmament and peaceful uses of nuclear energy. A Russian-made An-12 cargo plane carrying out a flight for a local airline crashed in a suburb of Manila as it made an emergency landing on April 21. At the time of the crash, according to a Philippine authorities report, six crew members – three Russians, two Uzbeks and a Bulgarian – were on board. The crash reportedly killed two Russians and the Bulgarian. The survivors, with burns and non-life-threatening injuries, were taken to hospital. The Russian Embassy in Manila is working closely with the Philippine authorities conducting an investigation. Those injured are being given necessary assistance. More information is available on the website of the Embassy: www.philippines.mid.ru. In connection with this tragedy the Russian Foreign Ministry expresses its heartfelt sympathy and deepest condolences to the bereaved families and wishes a speedy recovery to the injured. A handover ceremony for a consignment of Russian humanitarian aid to Tajikistan was held in Dushanbe on April 15. The aid consists of wheat flour. In 2009 Russia’s Emergency Situations Ministry (Emercom, the Agency for securing and co-ordinating Russian participation in international humanitarian operations) made gratuitous deliveries of flour to Tajikistan through the Russian Federation’s contributions to the UN World Food Program totaling US$5 million. The WFP Secretariat agreed with Russia's proposal concerning distribution of the voluntary contribution of Russia to the WFP Fund for 2010, including for food aid to Tajikistan in the sum of US$5.5 million. This amount, according to the Emergency Situations Ministry, bought 3,839 tons of wheat flour. According to the Emergency Situations Ministry, the shipment of flour (15 cars, 953 tons) to Dushanbe-2 Railway Station was completed on March 30. 11 carloads of flour arrived at the destination station. April 7 saw the completion of the shipment of flour (29 cars, 1906 tons) bound for Kurgan-Tyube Station. The shipment of flour (15 cars, 980 tons) bound for Khujand Station was completed on April 1. All of the consignment arrived at Khujand Station. Russia is confident that the supply of flour will help improve food security in Tajikistan. I was asked to comment on the results of the elections held on April 18 in Northern Cyprus. Dervis Eroglu, chairman of the National Unity Party (UBP), won the election held on Sunday April 18 in the Turkish-Cypriot community of the island. We consider the election results as a vote of confidence in the new leadership of the Turkish Cypriot community in its vision of ways to solve the problems facing the people of Northern Cyprus, and more specifically, find a solution to the chronic Cyprus question. The first post-election statement of Eroglu that he intends to continue talks with the leader of the Greek Cypriot community, President of the Republic of Cyprus Demetris Christofias, evidences this. He said a new negotiating team will soon be formed for the talks. From his statement, it is so far unclear on what basis the new Turkish Cypriot leader is going to build his negotiating strategy and tactics. Above all, we believe, these should fit into the framework established by the relevant UN Security Council resolutions on Cyprus, and develop the understandings reached earlier in the negotiations between Christofias and former Turkish Cypriot community leader Mehmet Ali Talat. It seems that a significant potential has already been amassed for working out a formula of the final settlement, to lose which the leaders of the communities simply do not have the right. We hope that the practical actions of Dervis Eroglu as the leader of the Turkish Cypriot community will lead to an early resumption of the negotiating process and will be aimed at achieving a comprehensive, viable and just settlement on the island in accordance with the UN Security Council resolutions and on the basis of a voluntary mutual consent of both Cyprus communities. From April 25 to 30, Moscow and St. Petersburg will host a youth conference of Russian compatriots living abroad entitled “The Saved World Remembers.” The trip of young representatives of the overseas community, arranged by decision of the Government Commission on the Affairs of Compatriots Abroad on the basis of the recommendations of the World Congress of Compatriots held in December 2009, will be a noteworthy event in the life of the Russian Diaspora in the year marking the 65th anniversary of Victory in WWII. One hundred and thirty envoys aged 18-25 from 55 countries will arrive in Russia. Participants’ stated themes of speeches attest to the principled civic stance of the young compatriots with regard to the attempts being made in a number of foreign countries to make heroes of the Nazis’ accomplices and falsify the results of the Second World War. I was asked how the Russian Foreign Ministry could comment on the reports of the detention of Russia’s Saratov City tanker by Georgian border guards in the waters of Batumi Port. According to our consular staff in Tbilisi, the vessel has indeed been arrested over a violation of environmental regulations. By decision of a Georgian court, a fine has been imposed on the ship owner, OAO Volga Oil-Tanker Shipping Company. It is expected that the company will pay it soon, after which the incident will be exhausted. Question: What is Russia’s reaction to the United States’ plans to deploy its Patriot systems in Poland, in close proximity to the Russian border? Answer: We closely monitor all US antimissile projects. In particular, we are concerned by the totally unwarranted US missile defense activity on the territory of Poland. We do not understand the purposes behind the plan to deploy Patriot air and missile defense systems near the Russian border. 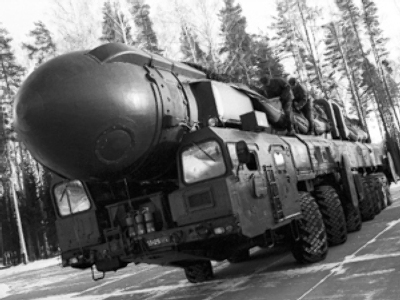 There is also no answer to the question: The warding off of what threats will be tested and perfected during the antimissile exercises scheduled for late May in the immediate vicinity of the Kaliningrad Region of Russia? Such unilateral US actions cannot but arouse our concern. Minister of Foreign Affairs Sergey Lavrov has repeatedly drawn attention to the fact that in a situation where on the instructions of the presidents of Russia and the US direct consultations are being conducted, a direct dialogue between our own and American experts on missile defense issues, such surprises would be better avoided. We are ready to continue the joint analysis of missile challenges and only later, when we come to a shared understanding of these challenges, make decisions on what steps are needed, including the question of what facilities to create and where. The same is true for the antimissile exercises. We have always advocated that this ought to be not just work between the US and Russia, but that European countries should be actively involved in it. We hope that the opportunity for such co-operation will still be there and that it will not be ruined by unilateral actions. Question: Will Russia take part in the international conference on Afghanistan in Kabul and at what level? Answer: At the Kabul International Conference on Afghanistan, Russia will be represented at the proper level. In this regard, I would like to note that the event is conceived in the same format as the London International High-Level Conference on Afghanistan held in January this year. As is known, Minister of Foreign Affairs Sergey Lavrov represented our country there. As to the conference timing indicated by Richard Holbrooke, we are awaiting information on this question from its organizers, the Afghan side. Kabul has so far given no specific date for the proposed forum. We so far operate only with the time parameters that have appeared in some media, in some cases with reference to the representatives of the United States. Question: Please comment on the situation in Kyrgyzstan. What is Russia’s stand on the resignation of Kurmanbek Bakiyev? Will the actions of Alexander Lukashenko influence the position of Russia? Answer: On this question I can say that it was partly answered today by Sergey Lavrov during his joint press conference with his Australian counterpart. There is nothing I can add to this. Again, detailed assessments of the current situation in Kyrgyzstan have been made by the top leadership of our country. Question: How does the Russian Foreign Ministry assess the results of the elections in Sudan? Answer: We continue to analyze the situation in Sudan following the elections. As to the preliminary results, at the last briefing we gave a detailed commentary on the matter. Let's wait when the situation finally clears up, and we will comment on it. The Special Presidential Envoy to Sudan, Mikhail Margelov, after getting acquainted in detail with the post-election situation, will also make relevant comments. Question: How can the Russian Foreign Ministry comment on the recent proposal of Azerbaijan to include Turkey as a co-chair of the OSCE Minsk Group on Nagorno-Karabakh conflict settlement, as well as on Iran's offer to mediate in the Nagorno-Karabakh settlement process? Answer: We are actively involved in contacts on this question. A number of proposals have been made recently. We are studying them. But in order to make appropriate assessments, we need to contact all of those involved in the negotiation process and determine their attitude to these questions. That's what we do. After some time following our contacts with our colleagues, we will be able to give detailed explanations. Question: At what stage is the consideration of the amendments to the law on compatriots and why the need for them? Answer: As far as I know, the consideration has taken place in the committees of the State Duma and Federation Council of the Federal Assembly. According to my data, consideration in a plenary meeting of the State Duma is currently being prepared. There has been sufficient information in newspapers and on television about progress in the consideration of the amendments and about all the debates. We have made this process as transparent as possible; a sufficiently large number of people took part in the discussion. Question: Is the imposition of sanctions against Iran possible earlier than June, when the Russian-aided Bushehr NPP will be launched? Answer: I would not like to guess. I can say that the comments on those contacts conducted in New York with the participation of the permanent representatives of the Six were made in our previous briefings. The picture will evolve with the development of the situation. I would not now anticipate, but would wait for the outcome of the active consultations in New York. Question: You said that the representation of the Russian Foreign Ministry in Kyrgyzstan now interacts with the Government of National Trust. With regard to the Embassy of Kyrgyzstan in Russia, what mode of operation is now conducted with it? Do you interact with the ambassador? Answer: I would like to make a small correction – we have the Embassy of Russia in Kyrgyzstan, not any other representation. With regard to the Embassy of Kyrgyzstan in Moscow, it continues to function and we maintain a working relationship with our colleagues.